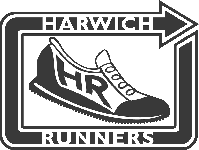 Please could you thank everyone from Harwich Runners who supported our trail run on Sunday. We had 59 runners in total and raised just over £250 which will be split between Colchester Hospital Stroke Unit and Help for Heroes. We had runners turn up from several different clubs; Tiptree, Colchester Harriers, Essex Mid Casuals, Gt Bentley, Springfield, Halstead, Basildon and a few unattached runners/walkers. Please could you pass on my thanks to the other clubs especially Tiptree who had 16 runners out on Sunday (the same amount as Harwich). The morning would not have been such a success without the generosity of everyone who turned up and not only paid to run but also made donations in exchange for tea and cake. Feedback from the majority of the runners was that it was an enjoyable route with good instructions. Most of the wrong turns came from HR, with Dennis covering a distance of 11.5 miles and Bob making it as far as mile 1 before returning to HQ for clarification on where to go! Trudy and I are hoping to host another trail run in the spring if we can get a different route organised. Thanks for all the help,(including Carla as honorary Mrs G for the morning!). Our next fundraising event is the Charity night at the United Services Club on Saturday 29th January £7.50 a ticket, I know that second to running the clubs next favourite hobby is drinking and eating so hopefully we’ll get good support from the Harwich Runners social contingent.